There is now a Gedankenexperiment MySpace up. There is basically one track there, ‘Conclusion’ the final track on the Experiment Defined EP. This is said to be a one-off project betwen Heinrich Mueller and Beta Evers so I guess we shouldn’t expect too much to change there. Don't forget Zerkalo playing live this Sat on 5th Feb 2011 in Brussels. I also found this brilliant photo essay about Detroit techno you might like. Daughter Produkt Over, this should be headline news and somewhere in the multiverse it may well be but it can be on DRL! Sadly and or inevitably, the Daughter Produkt MySpace has been taken down (there had been no activity there for a long time). This was a collaboration between Heinrich Mueller and Annie Hall, a Spanish producer and DJ. It began in 2007 but never blossomed into anything more than one track, a shame but still history which you can listen to on YouTube. No longer there after Mueller himself reportedly requested it be taken down, see comments, you have to be quick, hope you saw it. Always loved the .gif image they used, here it is again archived for you but not moving for some reason, used in the fan video too. She’s got a brutal new track called ‘Hell’ up on her MySpace right now, well worth hearing, keep up to date with her work from this link. More in-depth article about them I did later. The Gedankenexperiment record is out now available from the WeMe website. Another Drexciya featured and themed mix on Soundcloud not long up. There will be a Zerkalo gig at DNA, Brussels, Belgium on 5th Feb 2011. You can get onto DNA’s Facebook etc from this link for details. They have some new photos up on their Blog as well. Was sure I’d mentioned this before but Victoria Lukas did a guest vocal for Alek Stark last year. You can listen to it on bandcamp here, her vocal comes in after the 4 min mark in case you’re wondering. Great track too. Zwischenwelt's (featuring Heinrich Mueller), Paranormale Aktivitat, album on Rephlex (2LP and CD) has been listed for pre-order simultaneously on sites like Amazon, WH Smith, HMV and even Asda! (these have to all be operated by the same company then, the illusion of choice!). Still not out until late Feb though but I guess there’s no going back now. It’s getting the double vinyl treatment as well, sweet. No info about it on Rephlex website yet but LP detail’s are as follows. The Gedankenexperiment (Heinrich Mueller and Beta Evers) 12” on WeMe also won’t be out until Feb 2011 I hear. 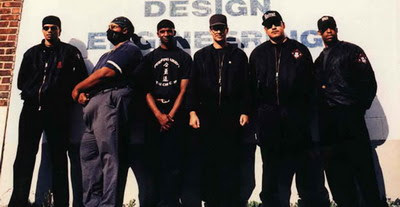 Lastly, I randomly came across the original picture which always gets cropped of James Stinson posing with the UR crew. Thought it was important to archive it here at last as I know I have seen at least one person asking about it somewhere. From around I would guess the mid 90's, interesting now to see the original context, second from left, he looks totally the odd one out.